Paying for a credit report is something a lot of people get told they need to do every six months or so. They go to a website that has the latest catchy jingle on the television and go and buy a merged credit report from Equifax, Experian, and Trans Union. The credit report is going to cost you $30 and you might even get told that you need to sign up for a credit watch thingy that costs you $25 a year. Stop wasting your money. You already know what is on your credit report, or at least you should. What do you get bills for every month? Do you get a credit card bill, mortgage, car lease, boat loan, time share or any other monthly payments? Yes. Than guess what, they will be on your credit report. Why do you want to pay somebody money to tell you what you already know? It’s crazy. This is just a way for the credit bureaus to make more money. Call A Mortgage Banker – Mortgage bankers and brokers live and die off of your credit report. It tells the entire story. Good bankers can dissect it in less than a minute. But you already know whats on it. The only reason you are calling is to have them spend the $25 to pull it. That’s it. Stay on the phone and have them tell you everything thats on it including your credit scores from Trans Union, Experian, and Equifax. When I was a mortgage banker I would tell them everything I saw. You might even get lucky enough to have a mortgage banker email a copy of the credit report over to you. Talk about a win win. And you save $25 buying the credit report. The only reason why you should ever check your credit report is when you know your credit is jacked up and you need to address it. If you pay your large bills on time (mortgage, car, etc.) and pay your credit card balances in full every month than you will have excellent credit. And in most cases the financial companies you work with will alert you when something fishy is going on with your account. Like un-authorized charges or even payment alerts. Take care of all of those as they happen and none of those get reported to the credit bureaus. 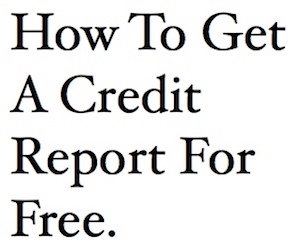 Lets say your credit report is not all that great and you need help. Many mortgage companies have set up their own in-house credit counseling departments. The reason why is they want to eventually be able to do a mortgage for you. When I saw on somebody’s credit report they were working with a credit counseling agency it made it nearly impossible for me to get them approved. Reason being is the second you sign up with a credit counseling agency it gets put on your credit report. In most cases I saw credit scores drop 100 points. And people pay the credit counseling agencies to work on their behalf. So when you call up the mortgage company to get your free credit report they might have a department willing to work for you to clear those items up. These departments do not report you are working with them to the credit bureaus. Everything stays in house. Another win win. Do not buy a credit report. Just don’t. Even if you are not buying a house. Even if you are in a good mortgage. And even if you know whats on your credit report . Call a mortgage company and have them pay to pull your credit report. Yes, it’s a little shady. So you will have to patronize the mortgage banker a little. Say you are curious about buying a home and want to see if you qualify. Or you have a mortgage right now and want someone to look at it. And during the process have them tell you whats on your credit report. If something unexpected is on your credit report or your credit is jacked up you may get lucky and the baker will send it to you for free. Some mortgage companies have a credit counseling division and will work with you in cleaning it up in the hope that when its done you will get a mortgage with them.